This Saturday night which will be Sunday morning Macau time, Manny Pacquiao attempts to climb back on the horse that bucked him and ride that thing in to the sunset of his career. The man that will be across the ring from Pacquiao is Brandon “Bam Bam” Rios, who’s full steam ahead style has everyone outside the Rios camp thinking this fight will be a one sided beat down not in his favor, and entertaining as hell while it lasts. Can Manny bounce back from the nightmare that still lingers from his fourth encounter with the Mexican legend Juan Manuel Marquez? Can Rios clip Manny with a fight changing punch making him an overnight star in the boxing world? 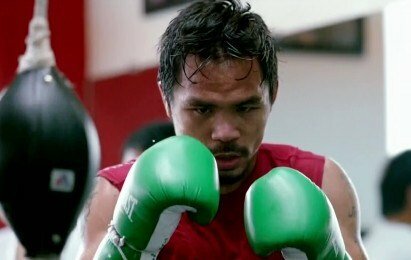 Manny is not returning to the scene of the crime, the MGM Grand Garden Arena, he is however returning to the ring after nearly one year removed from the sport. The time off could be just what the doctor ordered for Manny, who hasn’t taken any significant time off his whole career. Staying busy is crucial in order to be sharp and continue to raise a fighter’s profile, at some point though an athlete must rest the body and soul. The break could do wonders for the “Pacman”, who in recent years has lost focus in training camp not fully preparing for fight night letting his busy schedule get in the way. Rest will either help or push him further down the path to retirement. Which Manny will show up to fight who knows? The Pacquiao camp like most camps, has been feeding us a hot paper bag of poop swearing over and over that this is Manny’s best camp ever only to hear the exact opposite after his fights. Manny may be past his prime but just how far is the important question. Up until his demise he had Marquez in a tight spot with a broken nose and at least somewhat hurt. His hand speed and footwork looked better than it had in previous fights. He got caught with a perfect right hand early that put him on his back side but was able to right his wrong and was in back in control. With the style of Rios this fight and outcome may be misleading to judge if Manny is back to his old self after getting plaster head first into the canvas. Brandon Rios with his power punching ability will be a perfect test to gauge just how sturdy Manny Pacquiao’s chin is. The man they call “Bam Bam” more than lives up to his nickname with his come forward aggressive slowing wearing down his opponents on the inside. The psycho smile he flashes after an exchange, his left hook to the head and body, followed by straight right hands, are his signature punches. His power jab by itself can be a weapon haven already dropped a few guys with a just that straight stiff jab. Many media members and followers of the sport have labeled Rios as “Margarito 2.0”. Makes sense to an extent though Margarito busier and even more of a full speed ahead pressure fighter. Whereas Rios will plot his way forward with a tighter guard that helps block some of the incoming punches with his gloves. It will be interesting to see how similar this fight will be with Pacquiao vs. Margarito and if it plays out the same that could be a win-win for all parties involved. Manny easily won on the scorecards but got hit a ton not to mention hurt to the body on the ropes. He may have dominated the fight sure but Marg was able to land over 200 punches and Manny’s body overall showed the damage done by “The Tijuana Tornado”. Rios is coming off a close but clear decision loss to Mike Alvarado, whom he had knocked in their first meeting. Robert Garcia and Rios have talked about some of the new things that Brandon has been adding to his tool belt. They made it sound like he was working in repetition on a counter right hand of sorts to use the way JMM did in all 4 fights with Pacman. That’s all fine and dandy but if you not a true counterpuncher it’s not something you can add in one camp or maybe ever. Counterpunching is one of the most underrated art forms and is something that can take a life time to perfect. The last thing Rios needs is to be over thinking his gameplan versus a speedy fighter like Manny. Not that Rios won’t ever land a counter punch on Manny, he may be better off focusing on landing the better of the two in the exchanges that one can assume we will see throughout this battle. Will Manny more than any time in the past be hesitant himself when jumping in and out the way he does on offense? And if he doesn’t show much hesitation, will he stick to being smart instead of his usually over aggressive self. I see this fight starting out a bit slow and by that I mean for a round. After that it should feature many exchanges with a busy pace. I could see a trip to the mat from Mr. Rios and wouldn’t be shocked to see this fight being stopped on cuts and/or swelling. The unknowns are few heading into Saturday with the only thing were not sure of is Pacquiao’s current state both mentally and physically. Otherwise I don’t see Rios changing much and if he does he will probably abandon it early resorting back to what got him to this level in the first place. Like most Brandon will have all sorts of issues with Pacquaio’s hand speed and even with a good set of whiskers, Rios who has been hurt many times in the last few years, will have his chin tested which shots that he won’t see coming. This scribe can only see Rios winning if Manny is a shell of his old self. Rios will need to cut the ring off the way Margarito, who is better at that than Rios, did versus Pacman. “Bam Bam” will have plenty of moments in the fight but not enough of them to win rounds on the judge’s scorecards. My official prediction will be a late TKO stoppage or unanimous decision for Manny Pacquiao. Previous boxing news: Juan Carlos Gomez calls out Marco Huck!